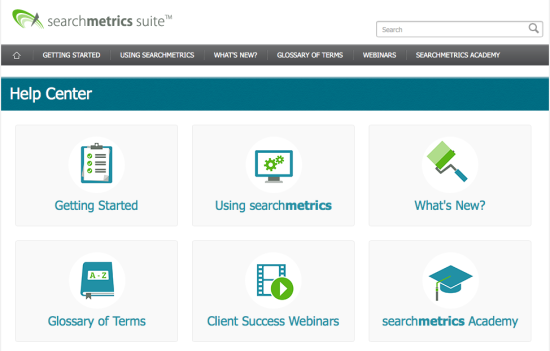 Introducing the Searchmetrics Help Center! The single most important value we hold dear at Searchmetrics is Client Success. For we believe that when you are successful, we are successful. As part of our commitment to this value, we work relentlessly to make sure you are supported in using our highly comprehensive suite of tools. We make sure you have a dedicated and experienced Client Success Manager. And we make sure you are comprehensively trained on the platform. We even rolled out a new certification program, setting the standard for SEO Excellence. We are proud of what we’ve been able to provide for all clients thus far, and now we are excited to announce yet another feature and resource to keep you in the loop with our rapidly updated platform. This week we launched our brand new “HELP CENTER” within the Searchmetrics Suite. This section of the platform has everything you need to familiarize yourself with how the suite works and how to use the comprehensive data within the platform. There are tons of articles complete with pictures and insights into how to use various sections, and we even have video tutorials. We are thrilled to release this new HELP Center. If you have an account or have been invited to a license/sublicense, you will be able to access all of these great resources and materials. If you don’t have a Suite license, reach out to one of our Sales Representatives today! Will your Searchmetrics Essentials clients also get access to a help center? Do you have a roadmap for future Essentials features and developments?